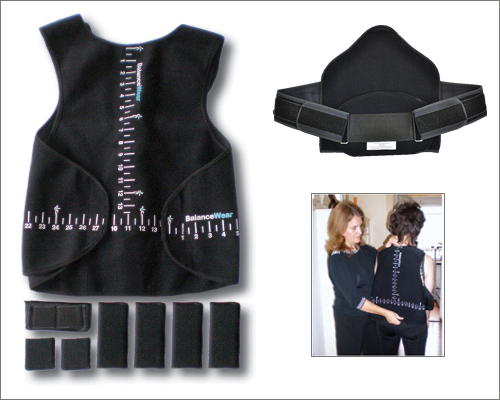 The Balance Assessment Tool Kit consists of an adjustable testing vest; rigid orthotic; five pounds worth of weights divided into 1/16, 1/8, 1/4, 1/2 lb. increments; and exam evaluation forms. The garment and weights are covered by hook and loop fabric, allowing weight placement anywhere on the outside of the device. This patented device contains indicator marks on the garment for use in documentation and repeat application of the weights. For use by a professional trained in Balance-Based Torso-Weighting® to determine whether the addition of supplemental sensory information is of benefit to the patient when used with the BW300 Device. Click here to view our BalanceWear® Measuring Guide video. Height	58 in. — 76 in. Waist	25 in. — 52 in. Pediatric, Youth, and Adult XL sizes are also available. Always monitor the patient while wearing the device prior to distribution. Patients who do not show immediate improvement or who become more unsteady should not be given a device for home use.